A male Purple Finch eats sunflower seeds from a feeder in New England, Oct. 2014. The Purple Finch doesn’t exactly fit in with my series of “Common Backyard Birds,” but this handsome fellow visited my feeder over the weekend so I’m including it anyway. (No, that’s not your cursor on its bill, that’s a sunflower seed shell.) It doesn’t fit in with the series because, sadly, the Purple Finch is not really a common backyard sighting in New England. The introduced House Finches certainly are, but the native Purple Finches visit less frequently. I can differentiate the finches because the Purple Finch is larger and bulkier. Its “purple” (really reddish pink) is also more widespread on its plumage. The females are even more tricky, but again, are bulkier than their House Finch counterparts. So an October sighting of a Purple Finch was most welcomed. Hopefully it’s a sign of things to come this fall and winter. Did you know: The Purple Finch is the state bird of New Hampshire. 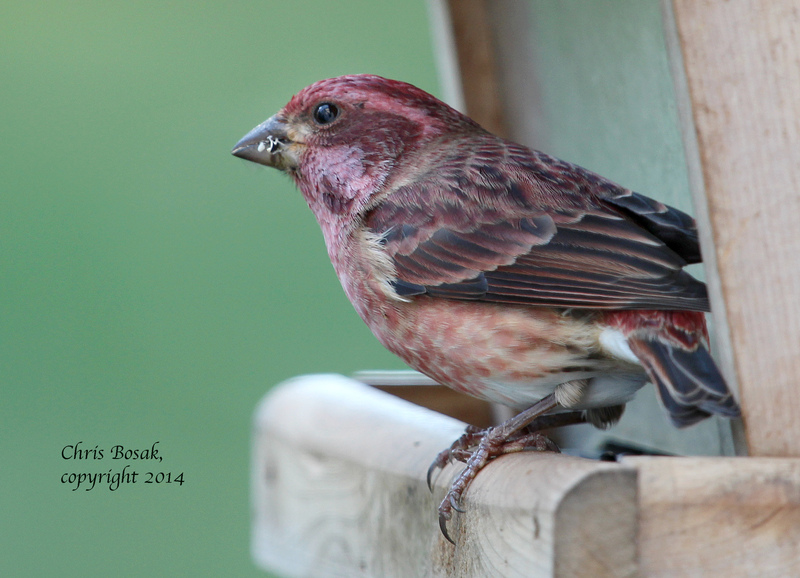 This entry was posted in backyard birding, birds of new england, Random photos and tagged backyard birds, birding columnist Chris Bosak, Purple Finch, Purple Finch photo, state bird of New Hampshire by Chris Bosak. Bookmark the permalink.